your probably wondering what the mini games will be for the undead, well me to. i'm working on that one right now. so far nothing comes to mind LOL lets face it their not a very lively bunch ! hummmm not a very lively bunch ...... maybe I can work with that! Skeleton bowling? Rolling the Bones??? SkeleLimbo? ok so I was kicking around the idea of the undead and how they apply to the world of Isadell, how they do their thing in the world of Splinterwoods so far this is how they fit in. First there was the demons. Though Erassabeth didn't know it, when she started rending the 9 seals of eternity she opened the world to creatures of pure hate, they have many names around the world the goblins call them Geejaw and the Elves call them Demons , Some demons are large powerful with ideas of destroying all they see, most Demons even the particular intelligent ones don't focus on anything but wanton destruction of everything in their path until they are overwhelmed and “killed” though they can't actually be killed only banished back into the Deep. However, some of the demon kin aren't so strait forward. The Morisite found they can cause more destruction to the world by corrupting it's inhabitants and allowing them to corrupt the things around them. The first Vampires were children of that corruption. It started some thousand years ago or so, there are few living who remember the time of the Aphotic ones. There were 8 in the beginning, they started reaching out and soon each of the original 8 had armies of lesser ones called vampires, of those vampires the first generations were called the Morisite after the demons that spawned them. Their subsequent generation took on the names of the sires and they created the 73 original clans of the vampire lords, they were able to create wyracks (undend sorcerer creatures barely bound to this world with contempt of all living things) the vampires used the Wyracks to spread their power to the dead things of the world and re-animate them. The wyracks created the lycanthrops and the wraiths , these creatures were the generals of the undead armies that surged forward consuming the world until they reached the Kragel mountains. It was here that the combined forces of all living creatures evil or otherwise combined to stop the Aphotic blight. Even Erassabeth understood that if the undead were allowed to spread they would not unmake the world but hold it forever in a choke-hold of death thus forever stopping her plan to un-do all that is and return to the way life should be. On each of the 15 peeks of the Kagles and great sacrifice was made by the most powerful conclave of sorcerers that would ever be including 2 of the 3 remaining Dawn Elves. It was there that the power of the undead was checked, and the living fought back, in the 100 year war that followed the 73 clans were destroyed to 4 and all but 2 of the Morisite vampires were destroyed and with the highest death toll of any battle before or since 7 of the 8 Aphotic ones were banished back into the deep. Nagreth the lord of the Aphotic ones was bound into the tomb of eternity and chained into the hart of a star. Once the threat of the undead was stopped the world knew peace for only a short time before the alliance if the living fell on itself and the factions split up again to wage wars on their one lands. The wards were in place and soon the world forgot about the two lords of Morisite who were quietly rebuilding their armies, there were after all 4 clans that remained unaccounted for and there is a stirring on the wind in the valleys of the blighted. So If you are making a foray into the Aphotic Blight (because your insane and have decided and eternity of servitude to demonic lords of the undead is your thing) and you run across undead it's to be expected. if you see vampires the danger factor just went way up but if your good you could still make it out, if you happen to see demons you're in real trouble, but even still if you keep a cool head you might make it out. However if for what ever reason you should see this guy... mortal terror and death would be the best you could hope for. 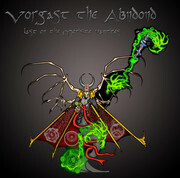 Vorgast the abandoned is one of the last two remaining Morisite Vampires. his back story is long and tragic (will be telling it later) Vorgast is powerful enough to bind greater demons with ease and he can even go toe to toe with elves of the dawn. Even Erassabeth will give him a wide birth as he's near God like in his ability to cause pain , fear and temporary death before your bound to his service forever. Lady Ellasaph was among the conclave that was called to stop the Aphotic ones, she found herself in combat with Vorgast alone for only a few moments before the battle was joined by many more powerful beings and was able to drive him back, but in those few seconds she acquired a mortal terror of Vorgast that took her almost a century to deal with and even mentioning his name will make her turn pale and get cold sweats. the only comfort she has from Vorgast is the knowledge that he can not break the binding stones in the Kragel mountains so he is bound to the Aphotic blight until they can find a way to destroy him once and for all. There is only one other being Vorgast give any respect to at all and she's the only other Morisite vampire still living. Vorgast is usually never found without his blood dolls and acolytes who are terrifying in their own right. and will be gracing these forums soon enough. here he is ... i'm super tirod though and I probably made a ton of little mistakes so I am probably going to make an edit.... I still have to make his base.